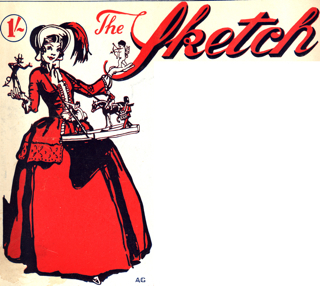 The Sketch was a British illustrated newspaper weekly, which focused on high society and the aristocracy. It ran for 2,989 issues between the 1st February1893 and 17th June 1959. It was published by the Illustrated London News Company and was primarily a society magazine with regular features on royalty and the aristocracy, theatre, cinema and art studies. It had a high photographic content with many studies of society ladies and their children as well as regular layouts of point to point racing meetings and similar events. Clement Shorter (1857-1926) and William Ingram started The Sketch in 1893, although Shorter's Oxford Dictionary of National Biography entry has 1892. Shorter was the first editor, from 1893 to 1900, succeeded by John Latey (until 1902) and then Keble Howard. Bruce Ingram was editor from 1905 to 1946. The magazine is chiefly remembered for first publishing the illustrations of Bonzo the dog by Studdy (from 1921). It also published series of short stories within its pages, one per issue, with authors such as Carleton Allen, Lucie Armstrong, Edwin Baird, Algernon Blackwood, Marjorie Bowen, E.M. Delafield, Nora Hopper, Walter de la Mare, William Robertson Nicoll, and John Courtenay Trewin. Under the editorship of Bruce Ingram, it was also the first magazine to publish short stories by Agatha Christie, starting with The Affair at the Victory Ball in issue 1571, dated March 7, 1923. Altogether, Christie wrote 49 stories for The Sketch between 1923 and 1924 (just under a third of her total output of short stories) which were later collected into some or all of the contents of the volumes Poirot Investigates (1924), The Big Four (1927), Partners in Crime (1929), Poirot's Early Cases (1974) and While the Light Lasts and Other Stories(1997). Christie dedicated the 1953 novel A Pocket Full of Rye to Ingram. As well as Studdy's work, The Sketch also printed illustrations by many other famous artists of the day including: Cecil Aldin, H. M. Bateman, Max Beerbohm, E. Blampied, Percy Venner Bradshaw, Thomas Arthur Browne, Fred Buchanan, René Bull, Hilda Cowham, Annie Fish, Fougasse, John Hargrave, John Hassall, Clarence Lawson Wood, Alfred Leete, Phil May, Will Owen, Bernard Partridge, Melton Prior, H. Radcliffe-Wilson, Frank Reynolds, W. Heath Robinson, E. H. Shepard, Sidney Sime, G. L. Stampa, Bert Thomas and Starr Wood. These are the years & images by Studdy I've gathered so far from this publication.